Based on L. Frank Baum�s beloved Oz series, this movie takes its material specifically from The Land of Oz and Ozma of Oz. It also has some nods to the 1939 film, such as her slippers being ruby instead of silver. Ever since her first trip to Oz, Dorothy has been having trouble sleeping at night. Something is deeply troubling her; she just knows her friends back in Oz are in trouble. One day on the farm, she is sent a key on a shooting star with the letters O-Z on the handle. When she is suddenly swept back to the magical land, with her chatty hen, Billina, Dorothy finds that her suspicions were correct: something terrible has happened. The yellow brick road is destroyed, the Emerald city has lost all of its gems and has fallen to ruin, and the citizens of Oz have vanished. 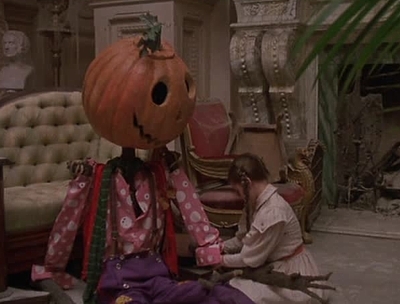 Dorothy must embark on a quest with Tik-Tok, Jack Pumkinhead, the Gump, and Billina to defeat Mombi and her master, the evil Nome King and save the Scarecrow and the land of Oz. I love this movie. I saw it on the Disney Channel when I was really young, and it has always been a favorite that I watch over and over. The time I really want to watch it though, is October. 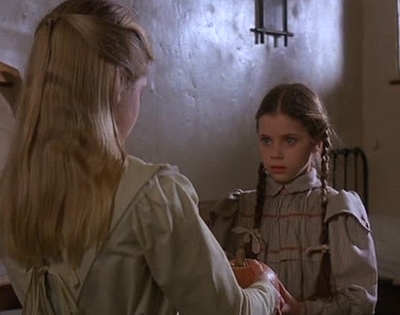 And it�s not just that the movie has some scary parts, it actually takes place in October, too! It changes quite a bit from the books that it is based on, but I myself really like the way they set it up. A fair word of warning: the freaky Wheelers and head-collecting Princess Mombi may scare you. They give me the delightful �Ooh, this is so interesting, but kind of scary� chill, but they actually terrify my sister. So, just be wary if you�ve never seen this one before. But after all, all the creepy parts (the Nomes, the Wheelers, the Deadly Desert, Mombi) are just like they are in the books. Does anyone remember the PBS television series Ghostwriter�? It ran from 1992-1995 and was a mystery serial starring a bunch of teens in Brooklyn who had a mysterious friend who couldn�t hear or talk, but could READ anything�Ghostwriter! Very good, fun, compelling, and had a lot of serious themes. Plus it was super nineties, so that makes it even more fun. If you remember it, or are interested, I recommend checking it out, the first season is out on DVD. The show also had a tie-in book series. I recently got a few of them from the library, and I would like to recommend Hector�s Haunted House as a spooktacular book to read! A little overview of the plot: Hector and his mother are moving into their first house! They are both very excited, and can�t wait to start fixing the place up and make it home. But then Hector receives an ominous note, telling him that their new house is haunted! 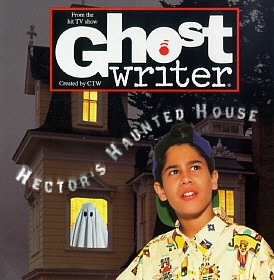 Soon he is haunted by the ghost himself, and so he and the Ghostwriter Team investigate to see if it�s all a hoax...or if Ghostwriter isn�t the only ghost around, after all. This book was really good. Everyone from the show was in-character, and the mystery got really creepy in some parts. When I read this one at night, I got scared! The backstory of the house was really interesting, too. If you like ghost stories, this may be one for you! 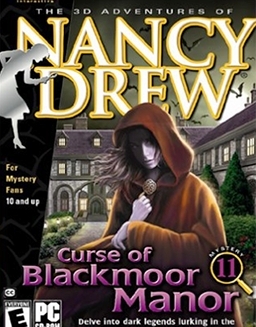 In the eleventh game of the best-selling Interactive game, you, playing as the title character Nancy Drew, are invited to stay at an old manor in England. But when you get there, strange things are happening. The lady of the household is bedridden and refuses to see anyone, and you begin to hear stories of the manor�s dark past, and a creature that may or may not be a myth. This game is really good. I love the Nancy Drew Game Series, and this one is one of my favorites. The mini-games are fun, the story is really intricate and well-written, and there are plenty of spooky moments that make you jump in your seat (a must for me with these games). This game is also one of the longer ones, with 20+ hours of gameplay! (The later ones are a lot shorter, because they started putting out several a year.) I recommend it to mystery lovers everywhere!